In the last blog we learnt about one unique environment of the Galapagos: deep water vents; where life has managed to evolve in one of the most hostile environments on Earth. If you missed it, you can check it out at Special Archipelago Part 1: Deep Water Vents. In this second blog of the Special Archipelago series, we will be carrying on the watery theme and taking a look at the oceans around Galapagos and what makes them one of the most productive fishing grounds in the world. 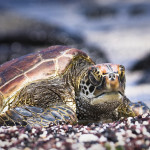 It is a process called upwelling which makes the Galapagos Islands a haven for marine life. Upwelling is the process by which cold water from the deep ocean rises towards the surface. This happens when the wind pushes warmer surface water away which is then replaced by the colder water below. Dead organisms decay on the ocean floor releasing nutrients and minerals into the ocean. The water in the deep ocean dissolves these nutrients. During upwelling, this colder nutrient rich water from the deep ocean is brought to the surface. It is this process which makes the waters around Galapagos so productive. 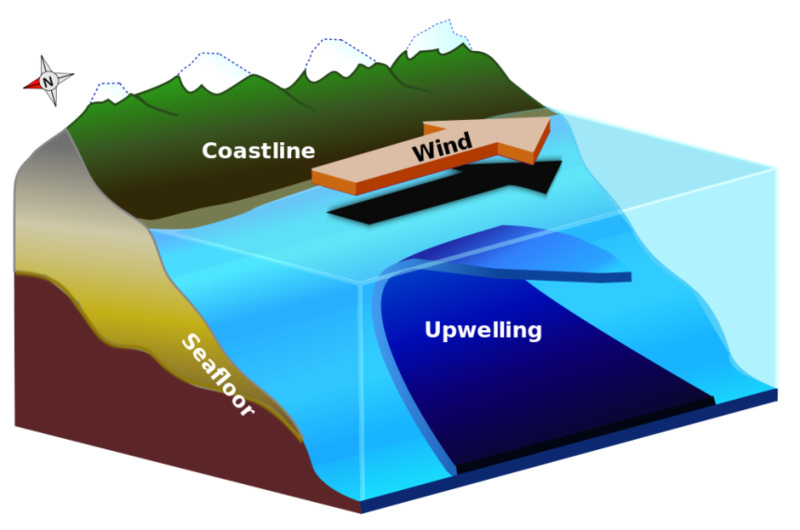 A diagram to demonstrate the process of upwelling. The influx of nutrients from the deep ocean allows life to flourish in the seas around Galapagos. Phytoplankton are photosynthetic bacteria which use the nutrients and sunlight to grow and reproduce. They are the producers of the marine food chain and account for over half of all photosynthetic activity on Earth. Primary consumers such as zooplankton and herbivorous fish feed on the phytoplankton starting the food chain. Many of the unique animals living on and around this archipelago rely on the oceans: from the most northerly penguins to impressive shivers of hammerhead sharks and from the only marine lizard to the largest fish on earth, the whale shark. Luckily this life has been protected by the Galapagos Marine Reserve, one of the largest marine reserves in the world and a UNESCO World Heritage Site. It was by the seas that most terrestrial life arrived on the Islands. In the next blog, we will be looking at the unique climate on the Galapagos and how this affects life on this archipelago. To find out more about the subjects discussed in this blog visit the Special Archipelago and Upwelling chapters on the Discovering Galapagos site. 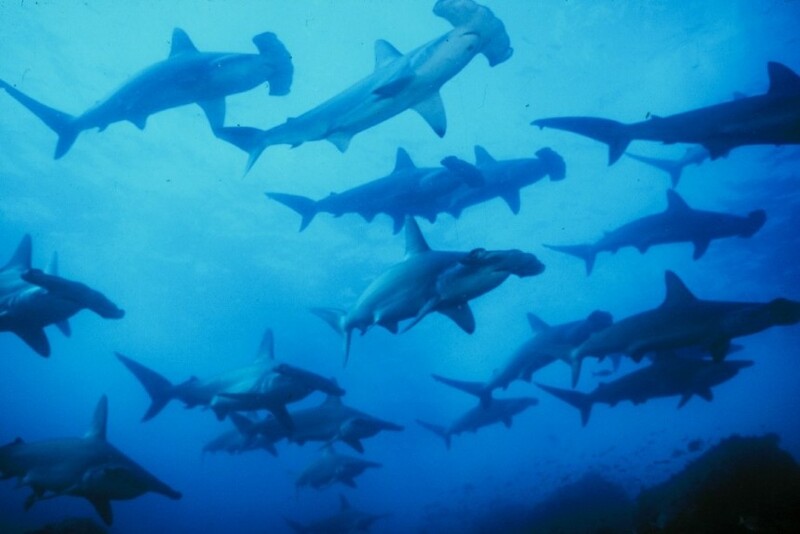 Categories: A Special Archipelago | Tags: Galapagos Marine Reserve, sharks, special archipelago, upwelling.